I must have discovered some new found appreciation for Breaking Dawn during my reread, since I enjoyed it way more than I did the first time. I flew through it, despite it being the longest of the series, and I think it might be my second favorite of the series (behind Eclipse, of course). I’m not sure what it was that made me love it the second time, even though I nearly hated it the first time around. I still found a good chunk of it boring and repetitive, and the plot still got stranger as it moved along, but I guess I liked that. Maybe it was the fact that the book didn’t focus on the tiny bubble that is Bedward. Instead we get a whole new cast of characters along side the favorites, and more outside forces. After the action-packed adventure that was Eclipse, Breaking Dawn is a completely different tone. There is no action, at all. Even the big fight with the Volturi that the Cullens are anxiously awaiting, never comes. They work it out by talking, but I think that works, since no one really wants it to come to violence. There’s about 200 pages where we leave Bella’s head completely and enter Jacob’s (and the pack by the nature of their connection). It should have been refreshing, but it was really boring. Every chapter was essentially the same: Jacob is in his wolf form on patrol, he phases back to human to visit Bella, Bella is overly excited to see him, something happens to upset Jacob and he takes off. Lather, rinse, repeat. We do get some interesting insight into the mind of the pack, especially Leah. It all felt like filler though as we wait for Bella to finally give birth, which was when things get interesting. Aside from my one-line scene in Eclipse, Breaking Dawn contains my favorite scene of the series: the birth. 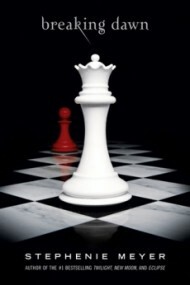 The first time I read Breaking Dawn, I had to read that part several times because I just couldn’t believe it! Edward bites the baby out! Literally, he chews his way through Bella’s womb since none of the medical tools are strong enough. It was awesome! It was the only thing that stood out to me the first time I read this, and was probably the only scene I actually remembered. Oh, there was also Jacob’s imprinting which weirded me out, because it prompted me to come up with this whole crazy, disturbing theory. I explained this theory to my mom as if it was fact, because let’s face it, it probably is. She found it strange too. My theory is that Jacob must have imprinted on the egg within Bella’s ovaries that was destined to become Renesme. What Jacob thought was love for Bella was really a longing for part of her female anatomy. Creepy. Anyway, Breaking Dawn was pretty awesome the second time around. It’s still quite bizarre in places, but I didn’t hate it this time, so that’s saying something. I’m glad there was a happy ending, but I wasn’t expecting anything but. I just wish it had been less anti-climatic. Its funny that when I think back to this book (which I read during a hurricane my senior year of high school), the only thing I remember is that one scene when Edward can hear Renesme's thoughts while she is still in the womb. That was one of my favorite parts because it actually has meaning and substance. The rest was just a huge growing climax that led up to not a damn thing. I was disappointed, although my expectations went out the window after I finished Eclipse. But Jacob will always be my favorite. He is the only reason I continued to read this series! Final book is okay but some parts of the book is graphic . Although some parts are slow it is intense.I love the love between Jacob and roseseme the little vampire.There is a major battle in this book. I don't really like it when authors have certain chapters for certain characters. I prefer when the story just flows from start to finish, everyone together in the storyline. I mean the story is still great, and I did enjoy the book - it had a great ending. Lets just say that when I re-read the series I skipped the entire 'Jacob' section in this book. I am a huge Twilight fan but am really a Twilight Series fan. I love Breaking Dawn just for the fact of all the events that take place. I love all the crazy madness that goes on in the book. I love the relationship that builds between the wolves & vampires toward the end. When it comes close to a fight how the wolves have the vampire backs. I like that Bella grows more mature in this novel. That she and Edward get to become parents to a vampire/human baby. I really cannot even wait for the movie's to come out. I truly hope that they will be able to keep all of the events from the book into the movie because that is what I am most looking for. I belive that this whole Series is really great that she will continue to write more great writing peaces. Honestly? Im a tad bit disappointed. concerns Edward. Bella consistently talks about how perfect Edward is. attracted to Edwards good looks than the person. Again, moving on. story simply in three novels. Reader reviewed by ruthie w.
Bella and Edward fell in love from the first book of Stephanie Meyers. But now they are taking it to the next level. with no more bad vamps trying to cause Bella harm, Edward is finally calm enough to focus on Bella. Bella has been through alot with Edward... but she's still going to be there for him, they take it to the next step and GET MARRIED! on the honey moon, Edward full fills his promise to Bella, but they end up in even more of a muddy puddle. Bella is blessed with a little... vampire or human? well when her health withers away, all the Cullens are trying to find away to support Bella's breaking body, and the little ones developing habit. but when the baby is ready to be born, will it kill it's mom to be able to breath, not on edward's hands, but when the vulturi think Bella and Edward have created a New Born, they are out for blood, not wanting peace and reassurance for anything. When they are ready to attack, their full spring, and won't stop until.. Renesmee proves that she isn't a new born. by talking with her hands.. and flashing images through peoples minds. brilliant finale to a much loved series. I am absolutely in love with Breaking Dawn. If you like vampires, cute boys, drama, intense excitement, and love stories, then this book is for you! It is a long book, but a fast read. I bet you will have trouble putting the book down! It has all of your favorite Twilight characters in it plus many new arrivals. You will never believe what happens to Bella and Edward in this book. Something extra special also happens to Jacob, but I can't tell you what. You just have to read Breaking Dawn!!!! Breaking Dawn is the final book in the Twilight Saga. Breaking Dawn is broken up into three different books, with one and three being told from Bellas perspective and then the second book is told from Jacobs perspective. The book opens with a few days before Edward and Bellas wedding. Bella is upset that she hasnt seen Jacob in a long time because he has remained in his wolf form and is in Northern Canada. When Bella returns home from getting gas she finds Alice finishing up measuring her dad for his tuxedo, only to find its her turn to get measured for her wedding dress. All Bella can think about is Edward and how nice it will the wedding and honeymoon will be. For the honeymoon, Edward takes Bella to a secluded island, called Isle Esme, of the coast of Brazil., which was a present from Carlisle. Edward and Bella make love for the first time but they argue because Edwards passion leaves dark bruises on Bellas body. Bella soon finds herself constantly hungry and sick and realizes shes pregnant. They cut honeymoon short and rush back to the Cullen mansion. Book two, which is from Jacobs perspective, is about when he finds about how Bella contracted a rare disease while in South Africa. He rushes to the Cullen household to find out that this is not true and the childs rapid growth is hurting and endangering Bellas health. Tensions run high during the time of the pregnancy, but Edward delivers the baby girl and Jacob looks into the Renesmees eyes and imprints on her. When the book returns to Bellas perspective again, she is experiencing the painful transformation from human to vampire. Edward did this shortly after her giving birth to Renesmee because she is half vampire. Bella is able to demonstrate self-control both while seeing her daughter and while hunting which is very rare for newborn vampires. Before Bella and Edward go hunting for the first time, Alice shows Bella her reflection. Bella sees herself as a beautiful woman with flawless skin. She is graceful, strong and fast. Renesmee is growing at an amazing rate so she looks older than her calendar age. Bella learns of Renesmee's gift - the ability to communicate by sending images to people's minds through touch. Finally, the Volturi pay a visit to the Cullens thinking that Renesmee is an immortal child, but shes not. Shes half vampire and half human. In the past immortal children had caused mass destruction and the past. Bella also makes use of her gift which is mind-privacy she is able to shield others from other vampires powers. After all the chaos, Bella and Edward return to their cottage and put Renesmee to bed. Bella places her hands on Edward's cheeks and tries to push away her shield. She has been secretly practicing for this moment. She thinks of all of her special memories that she wants to share with Edward. He is finally able to see for the first time just how deeply she has always loved him.